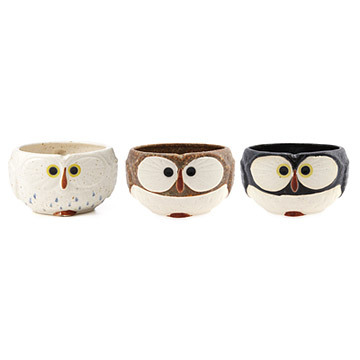 Sure to make you hoot and holler, these wise owl visages peer out from these stoneware mugs. Hoot, holler and call your friends over to enjoy a delicious drink in these novel, stoneware owl mugs. The owl faces will inspire chatter no matter the time of day. Made in Japan. The owl mugs make me smile. My original plan was to use them in the kitchen , but I like to see them more. They now hold coins and rings on my windowsill. I think I'm going to order the other two so I have the entire set. I bought this for friend for her Christmas present. We love to get together for coffee and I thought this was perfect. I love unique gifts and this was exactly what I was looking for. This mug is absolutely adorable but it is much smaller than what I expected. The tag in the bottom labels it as a soup mug but it won't hold much soup, let alone coffee. Super cute for decoration but not very practical for everyday use. These are cute. I bought 2 for my sister for Christmas. It's smaller (shallower) than I had anticipated, but very nice quality. My friend is a big tea drinker so I gave her the mug along with a box of herbal tea. I didn't realize the mug would be so small, but she absolutely loved the style.